WASHINGTON – Monsignor John B. Brady says he got his vocation at the 1950 National Scout Jamboree. Sixty years later, the priest of the Archdiocese of Washington, a chaplain for the National Catholic Committee on Scouting, was one of more than 20 priests and deacons serving as chaplains at the Boy Scouts’ 2010 national Jamboree at Fort A.P. Hill, Va. – and he ran into a seminarian who said he found his vocation at the 2005 Jamboree. As more than 30,000 Boy Scouts and Venturers – who include girls – gathered for the Jamboree marking the 100th anniversary of the Boy Scouts of America, chaplains of all different faiths were there to help guide them, discern what God wants of them and encourage them spiritually. Besides rafting, rappelling, swimming, canoeing and a host of other outdoor activities, the Scouts could work on their Duty to God patch. For a month before the Jamboree, Bishop Gettelfinger, 74, served as a chaplain at the Boy Scout ranch Philmont, in northern New Mexico. This was his sixth year of spending several weeks there, keeping in touch with his staff back home via e-mail and phone. At the Jamboree, the bishop wore his Philmont chaplain shirt and hat as he worked the booth for the National Catholic Committee on Scouting. But Aug. 1 he donned vestments as the principal celebrant for a Mass concelebrated with three other bishops, a bishop-designate, and more than two dozen priests and deacons. 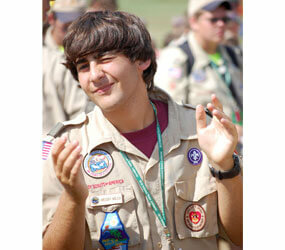 More than 15,000 Scouts and leaders attended. “When these kids stood there or sat there on the grass – the last jamboree it rained for two hours, and nobody moved – it’s an incredible witness of faith,” the bishop said. The bishop said the chaplain corps has helped the Boy Scouts in times of emergencies, such as at the 2005 Jamboree when four adults leaders were electrocuted. “Our priests do wonderful work there, I can guarantee that,” he said. Monsignor Brady said one of the things the Scouts must do to earn their Duty to God patch is visit with a chaplain. “We get people of every faith coming, not just Catholic,” he said, noting that the chaplains represent multiple faiths – as do the patches. He said he tells the Scouts that duty to God “means they should have a personal relationship with God” – talk to him and read the Bible or Quran. He said that, as a boy, he attended the first national Jamboree on the Mall in Washington in 1937. World War II delayed subsequent Jamborees, and he did not attend again until 1950. At that time, he said, he was a senior at Georgetown University in Washington and was Scoutmaster of his parish troop – one of whose members attended the Jamboree in Valley Forge, Pa. While the young Brady was visiting his Scout, a priest from New York noticed the Scoutmaster’s ROTC uniform and encouraged him not to join the military, but to enter the seminary. He said the priest sent him to a young seminarian – Walter Sullivan, later bishop of the Diocese of Richmond – who took him on a tour of St. Mary’s Seminary in Baltimore. “I’m a priest today because I attended the 1950 Jamboree,” he said.